"Une Invitation, S'il vous plaît!" 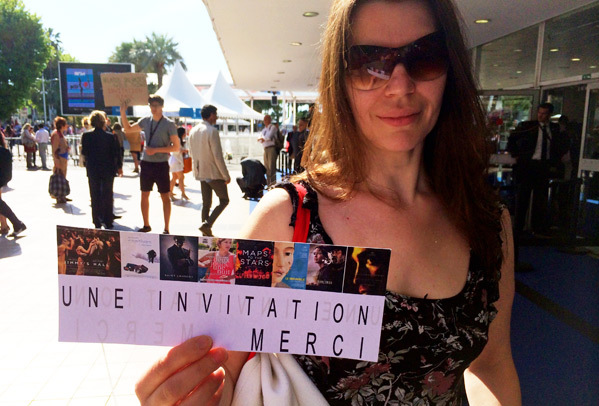 Those who frequent the Palais day in, and day out, at the Cannes Film Festival are unquestionably aware of the ticket seekers found outside of the entrance. They're there every day, from morning to midnight, requesting "one ticket, please (and thank you)". "Une" just means "one", and an invitation is the name for the ticket at the festival. S'il vous plaît, often abbreviated "S.V.P." on the signs, means "please" in French. After years of encountering, interacting with, and admiring these dedicate moviegoers, and their increasingly impressive signage, once again inspired by Ebert I've decided to write a tribute to them. If you've ever wondered how to get a ticket in to a Cannes screening this is the trick to learn. 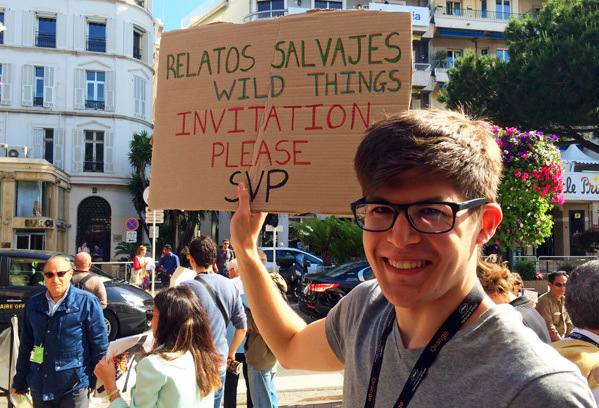 It's not uncommon to find ticket seekers at many film festivals around the world. One of my friends and one of the most die-hard cinephiles I know, Dor Dotson (@dordotson), grabs most of her tickets at Sundance every year by holding up a sign like this - and she usually sees upwards of 50 to 60 films by the end. That is true dedication, and she has all my respect for pulling that off year after year. 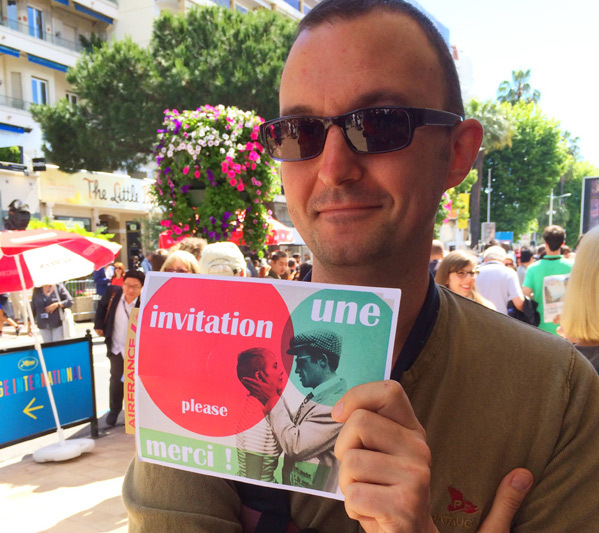 I will admit the first time I ever saw the "Une Invitation" signs in Cannes, I chuckled. But now I watch them every day, every year, and I've honestly come to admire them. I complain about having to stand in line for over an hour, but they stand outside all day. All for the love of cinema, all for a chance to see a film that could be awful, or life changing. "The screenings are held from morning to night in the new festival palace, which was opened three years ago [in 1984] on the site of the old casino, next to the yacht harbor. The big concrete building is essentially several giant auditoriums surrounded by terraces, meeting rooms, restaurants, a nightclub, and a casino. 'It looks like a cross between a parking garage and a machine-gun emplacement,' New York press agent Billy (Silver Dollar) Baxter observed when it opened, and the Palais has since come to be known as the Death Star because of its undeniable resemblance to Darth Vader's mother ship. The [old] Palais Croisette, which was built after the war down at the other end of the Boulevard Croisette, near the Carlton Hotel, has been scheduled for demolition ever since the new Palais opened, but has so far received an annual reprieve as the home of the Quinzaine des Realisateurs, the Director's Fortnight [this is no longer the case]. Screenings are also held in every commercial cinema in town, especially those strung along the rue d'Antibes, the shopping street a long block inland from the Croisette. 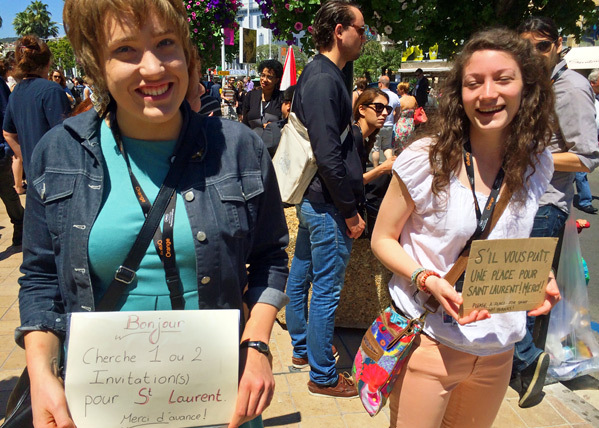 The public is not encouraged to attend the festival, but admission to screenings is free for anyone who can obtain accreditation, and every year thousands of the most amazing candidates are accredited." As far as I know, those statements in the except were written before the current era of asking for tickets and getting in with an invitation. Back when Ebert was writing this book (in 1987), it really was impossible to attend Cannes screenings as a regular member of the public. Nowadays it's kind of sort of possible, if you can get the right badge, and the right ticket, and/or otherwise sneak your way in. In this current era, ticket seekers can be found at every film festival from Sundance to Tribeca, usually hanging outside of the popular venues with crude signs, though recently the signs have been improving, too. One thing is consistent - they always have a smile on their face (unless they've been waiting the entire day and haven't had any luck yet). In the evenings, you'll find dozens of ticket seekers already dressed in tuxes and gowns, ready to walk up the red carpet into the premiere the moment they get a ticket. I've seen them at all hours of the day, morning, noon and night, all ages of cinephiles, all types, all kinds, just hoping to get a ticket into a Cannes screening. These people are some of the most passionate cinephiles out there, they are the ones who wait and wait (and wait) until that lucky golden ticket lands in their hands, providing them access to the wonderful world of cinema. Every time I leave the Palais, I always wish I had a few extra tickets tucked away in my back pocket, so I could reward those with the biggest smile and most passionate plea. They really truly deserve to get in. After a few days of passing by many of these people, I snapped a few photos of my favorite signs and those with the brightest smiles, as a tribute to the dedicated cinephiles who wait for some luck every single day. I would love to know how many tickets these people actually get, and how often they can get into a film. It very likely depends on the film (the more buzz, the harder it is to find one) and the venue (more seats, more tickets) but at the same time, I've seen many of them successfully score an invitation. It works. While I do encourage getting actual accreditation for the festival if you're really interested in attending and screening most of the films, I still respect these people, trying their hardest to get in to see a film the only way they can (for now). If I had extra tickets, I know where I'd take them. And I encourage anyone who is reading this and ends up with an extra one to bring it to these people. I guarantee you there's a handful of them roaming the streets now, looking to get into tonight's big premiere. They'll be forever grateful to you for the access. Onward to my next screening at the 2014 Cannes Film Festival, which will be Cronenberg's new film Maps to the Stars. We're now to Day 5 with plenty of premieres still to come, so stick around for more reviews, blogs/editorials, and Ebert quotes from Two Weeks in the Midday Sun that will make you laugh and smile.